(Phys.org) —Figuring out how to survive on a lean-season diet of hard-to-reach ants, slugs and other bugs may have spurred the development of bigger brains and higher-level cognitive functions in the ancestors of humans and other primates, suggests research from Washington University in St. Louis. 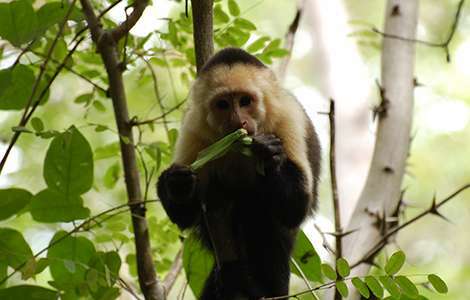 "We find that capuchin monkeys eat embedded insects year-round but intensify their feeding seasonally, during the time that their preferred food – ripe fruit – is less abundant," Melin said. "These results suggest embedded insects are an important fallback food." necessitated by more intense periods of fruit shortage," she said. 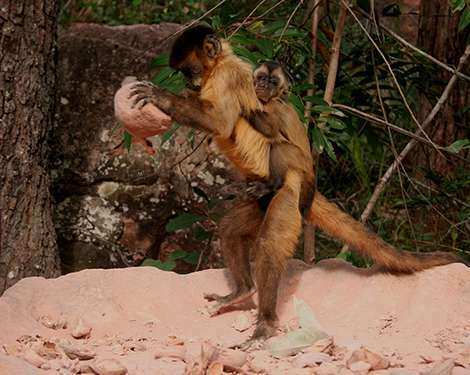 More information: Amanda D. Melin, Hilary C. Young, Krisztina N. Mosdossy, Linda M. Fedigan, "Seasonality, extractive foraging and the evolution of primate sensorimotor intelligence," Journal of Human Evolution, Volume 71, June 2014, Pages 77-86, ISSN 0047-2484, dx.doi.org/10.1016/j.jhevol.2014.02.009. Biology papers always sound Lamarckian. 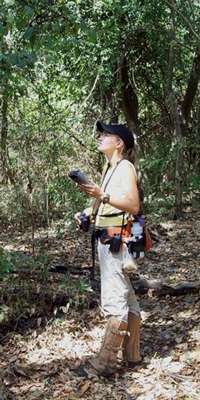 The cognitive challenges didn't prompt brain changes to figure out the puzzles of getting insects, any more than the challenge of getting leaves from tall trees prompted giraffes to grow longer necks. ...that has it backward. It wasn't figuring things out that spurred bigger brains, it was having bigger brains that allowed figuring out efficient diets. I know it's a common dissonance to reverse evolutionary cause and effect to make for a better story, or a wider audience, or ... something. But I think it does a disservice. I have a friend who, to this day, still believes Lamarckian myths and misinformation, mostly due to this kind of reverse-cause written science articles.